Received October 12th, 2010; revised January 6th, 2011; accepted February 17th, 2011.
decreased in the order PVC, PVC/ELNR-30 (90/10), PVC/ELNR-30 (80/20). usually has molecular weight less than Mv 100,000.
while the minor component forms the discrete phase. 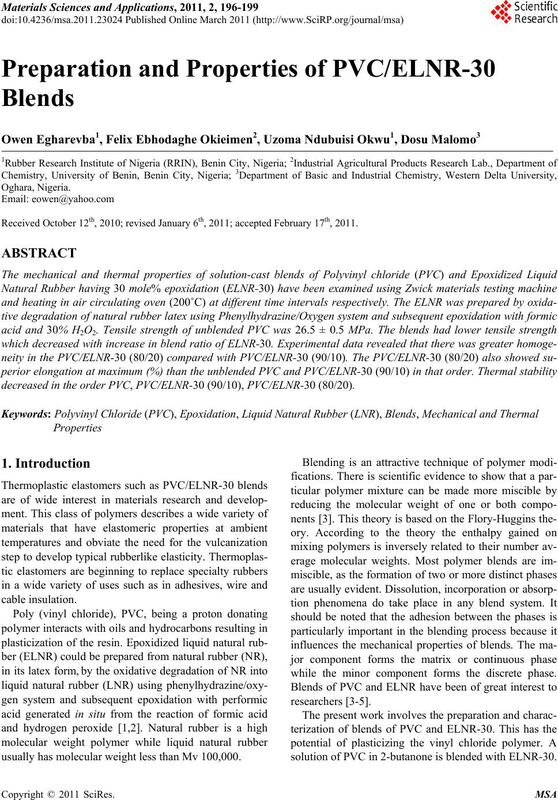 solution of PVC in 2-butanone is blended with ELNR-30. Fluka. 30% hydrogen peroxide was obtained from Merck. temperature and diluted with 100 mL distilled water. Table 1. 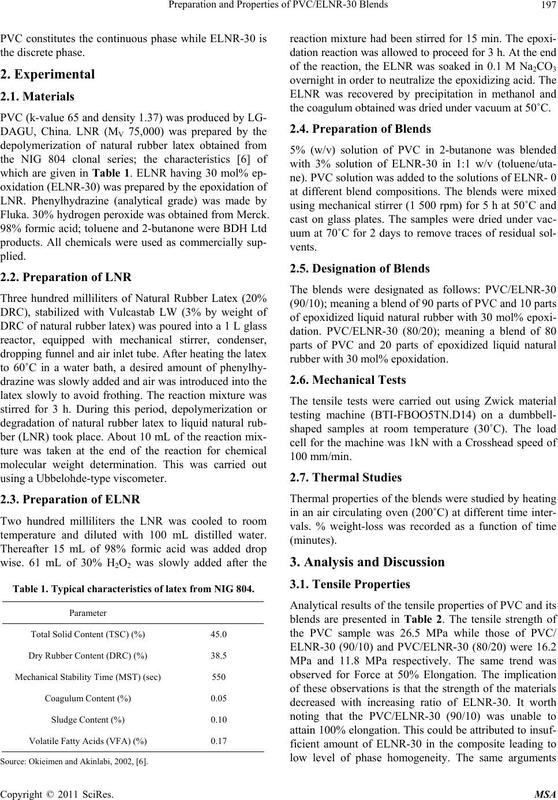 Typical characteristics of latex from NIG 804. 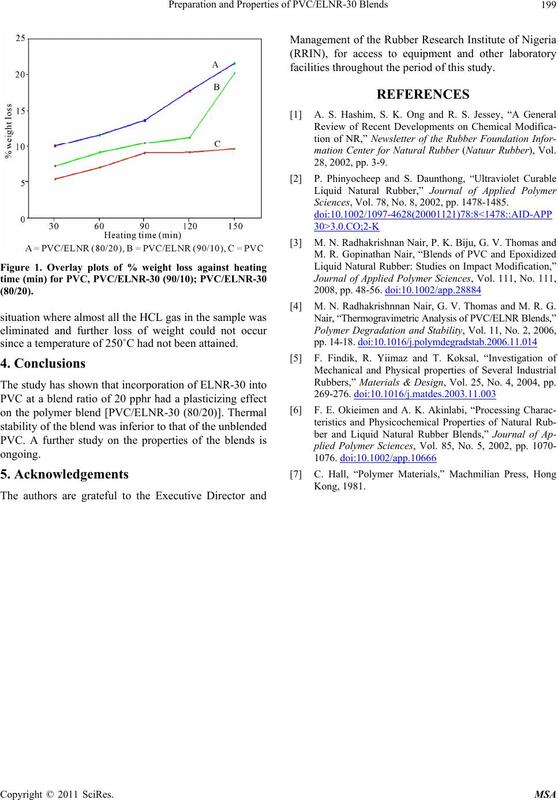 Source: Okieimen and Akinlabi, 2002, .
the coagulum obtained was dried under vacuum at 50˚C. rubber with 30 mol% epoxidation. elimination of HCL gas at much lower temperature . Table 2. Tensile data of PVC and its blends. Table 3. 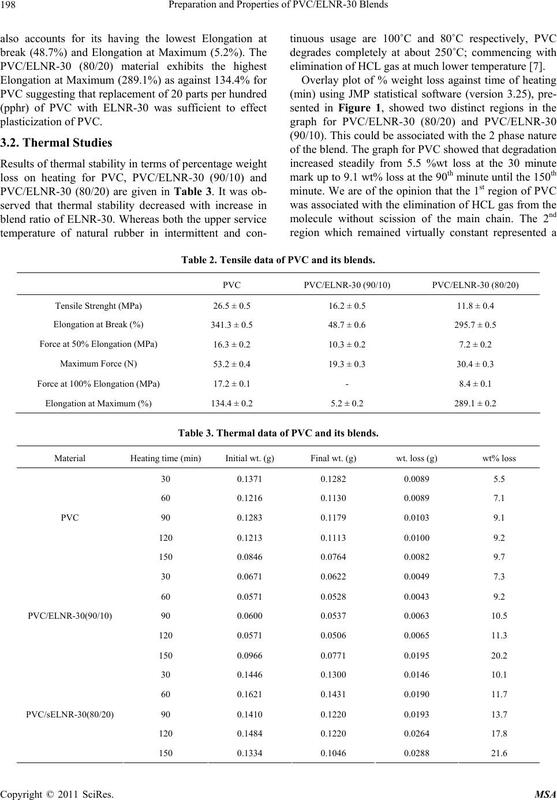 Thermal data of PVC and its blends. since a temperature of 250˚C had not been attained. facilities throughout the period of this study. mation Center for Natural Rubber (Natuur Rubber), Vol. Sciences, Vol. 78, No. 8, 2002, pp. 1478-1485. M. N. Radhakrishnnan Nair, G. V. Thomas and M. R. G.
Rubbers,” Materials & Design, Vol. 25, No. 4, 2004, pp.